This is one of Dawn's last pictures of Ceres, taken on Sept. 1. As explained below, by that date, when the spacecraft was at low altitude, the ground beneath it was in darkness. But 10 hours after skimming low over the ground, Dawn looked down from 2,340 miles (3,770 kilometers). 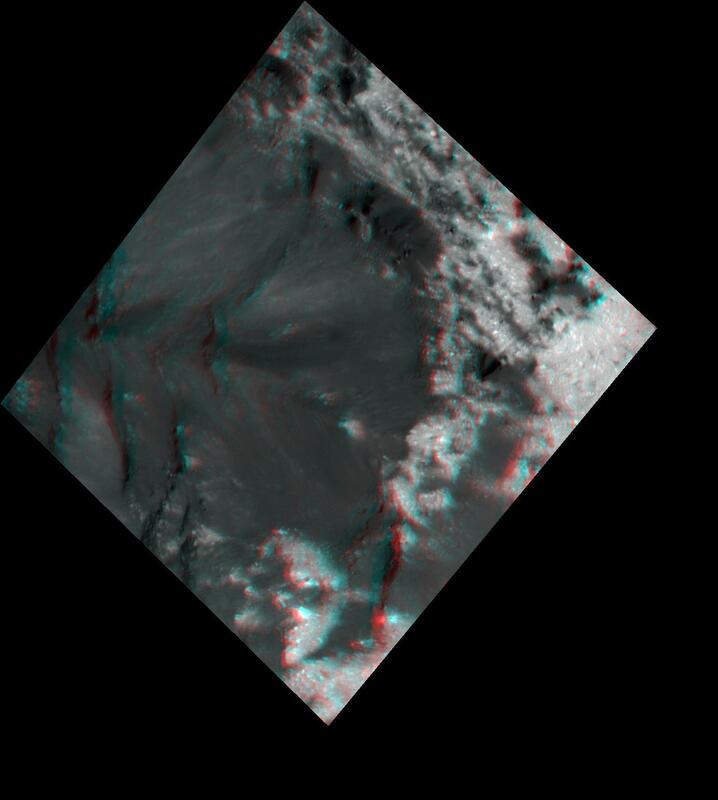 From this vantage point, the gleaming features in Occator Crater were as mesmerizing as ever. Cerealia Facula, the bright center of the crater, was 2,470 miles (3,970 kilometers) away. Dawn was looking south, so Vinalia Faculae, the grouping of other bright regions to the east, are left of Cerealia Facula, opposite the usual perspective. (Rotate the picture to put the limb at the bottom to see the conventional orientation.) We have seen many other views of the 57-mile (92-kilometer) Occator Crater and its highly reflective deposits of salt, most recently last month. Full image and caption. 1. Things that can’t go on forever, go on much longer than you think they will. 2. Corollary 1 applies even after taking into account Corollary 1. Dawn observed this area southwest of Cerealia Facula, near the center of Occator Crater, on July 4 from an altitude of 30 miles (48 kilometers). The view here is 3.0 miles (4.8 kilometers) across. Sunlight comes from the top of the picture, so the many straight features that are light on the bottom and dark on the top are fractures in the ground. Similarly, craters are light on the bottom, where the crater wall catches the light, and dark on the top, where the wall is in shade. Elevated features, like mounds, in this strange terrain are light on the top and dark on the bottom. Several pictures in the Aug. 22 Dawn Journal show similar fractured scenery. Full image and caption. Dawn's interplanetary trajectory (in blue). 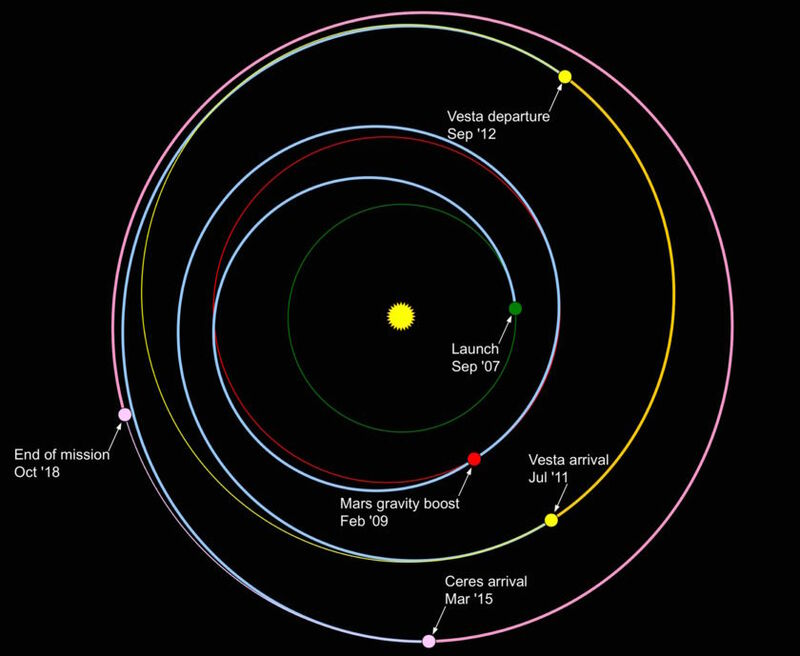 Over the course of the mission, we have charted the spaceship's progress on this figure, most recently in September. There will be little need to update it again. 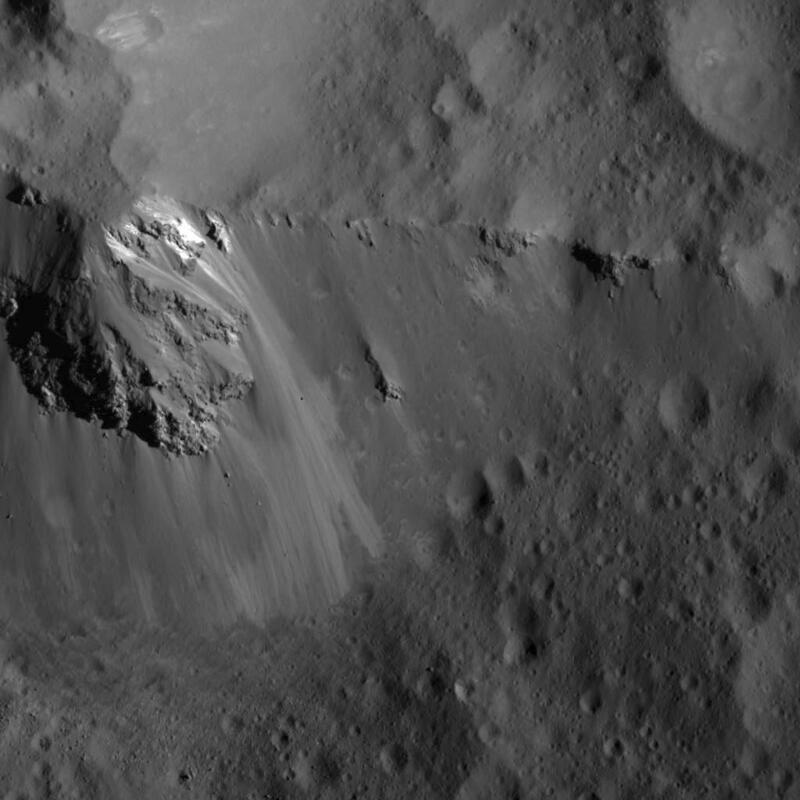 Dawn took this picture of a ridge in the center of Urvara Crater on July 16 from an altitude of 32 miles (58 kilometers). The scene is 3.4 miles (5.5 kilometers) wide. Note the patterns of flow down the slope. We saw this landscape from twice as high (and therefore with only half as much detail) in August. 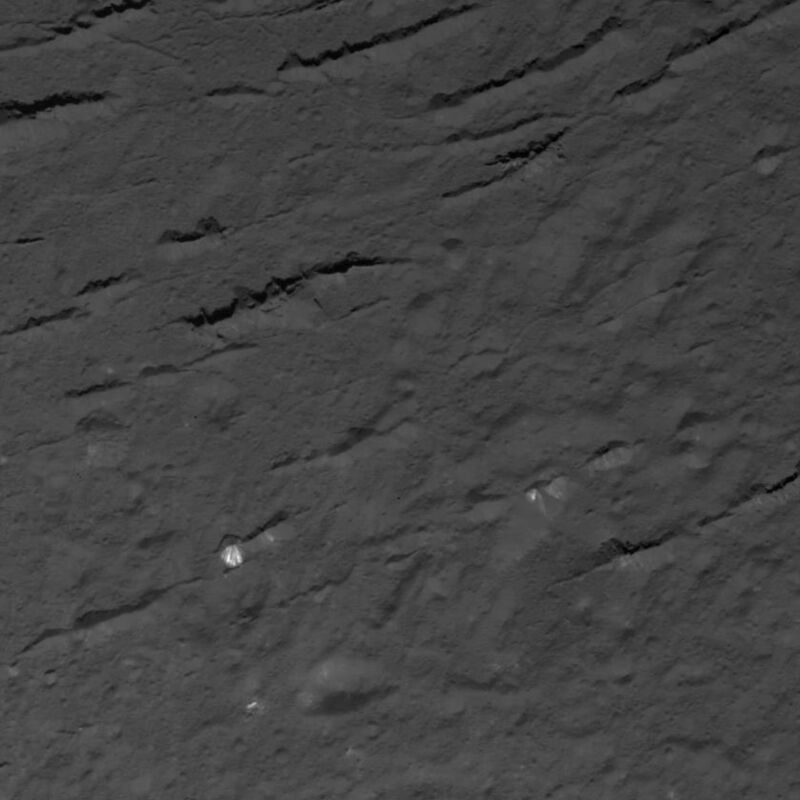 The location of peridemeter shifted in XMO7, so during the 10 days between the earlier picture and this one, Dawn's altitude when it flew over this location decreased, allowing it to capture this sharper view. Full image and caption. 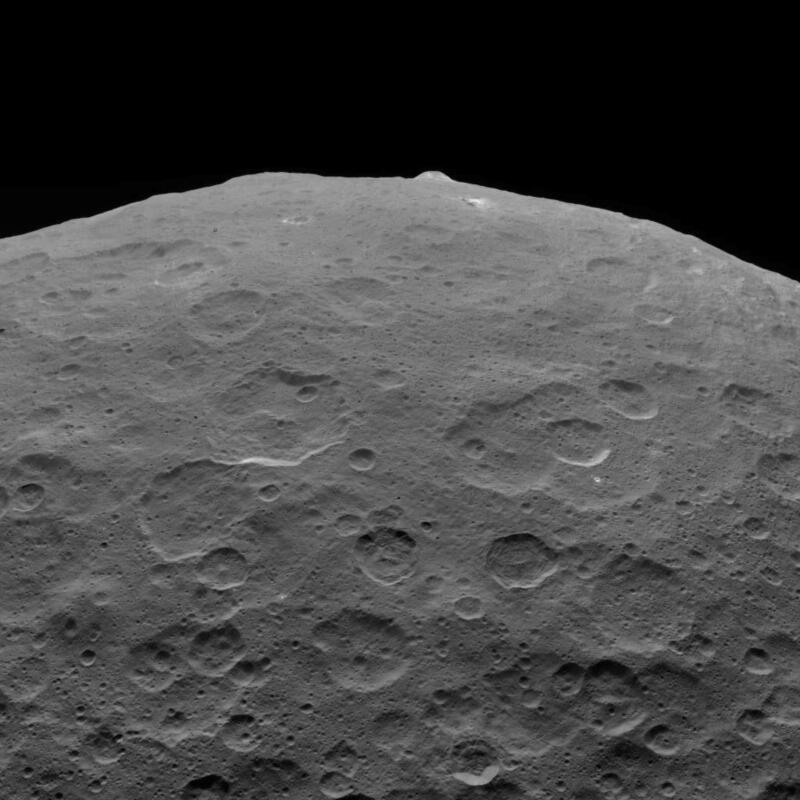 On Sept. 1 while coasting up, Dawn looked back at Ceres from an altitude of 2,220 miles (3,570 kilometers). Prominent on the limb, at a distance of 2,500 miles (4,030 kilometers), is Ceres' youngest cryovolcano, Ahuna Mons. Scientists have identified more than 20 other likely Cerean cryovolcanoes, but they are generally less distinct, because, like some of the craters, the dwarf planet slowly erases them. We have seen many other views of Ahuna Mons, most recently here. We saw the mountain on the limb (with Occator Crater in the view as well) from even higher up last year. Full image and caption. This 3-D image of an area northeast of Cerealia Facula was constructed with two photos Dawn took from an altitude of 21 miles (34 kilometers) in June. The spacecraft peered down at this exotic landscape from different angles in two orbital passes, providing the pair of stereo pictures. To perceive the 3-D, you need color filters, with red for your left eye and blue for your right. (You could get a 4-D view by looking at it for a while. However, apart from the daily and annual changes in the angle of the incoming sunlight, no changes are expected to be discernible even over a few years. Patience, and a follow-up mission, would be required.) Full image and caption. Thanks Marc, for helping us be stowaways on your fantastic journey. Such a wonderful mission, so well described. Hello, It's been a while since I commented a Dawn Journal entry! Really wanted to thank you for all your hard work, your dedication and patience throughout all these years. Thank you Marc, may the future be bright with lots of new and exiting adventures. Guillaume. One question that I have wanted to ask for a long time about the ion propulsion: The specific impulse (exhaust velocity) is quite high in these engines. Does it mean that those few Xenon ions will escape to the interstellar space from our solar system? Hi Marc. My son was born just after Dawn left Earth. 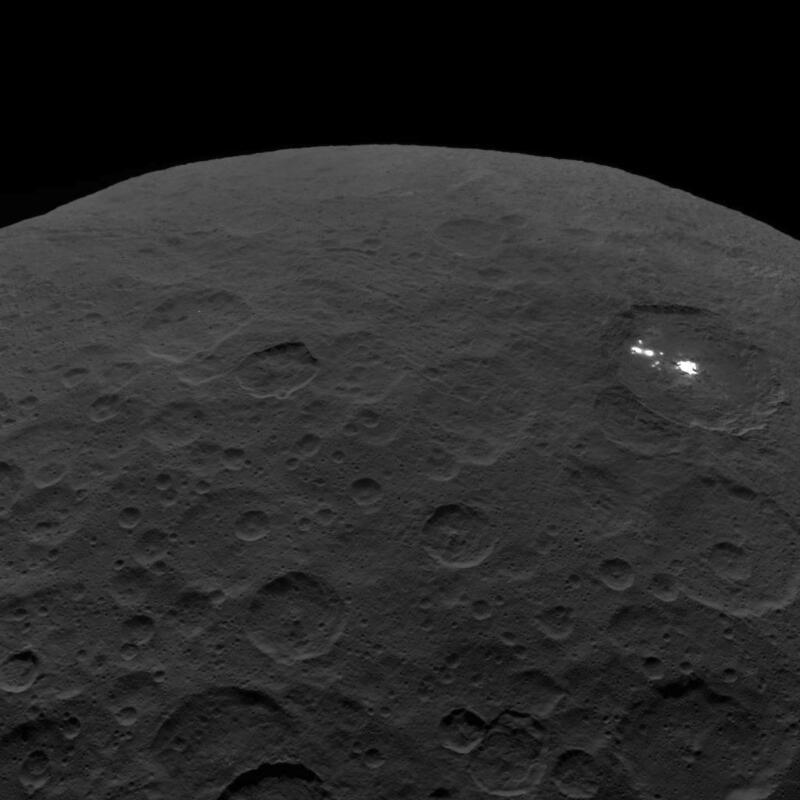 He was still young at Vesta, but Dawn lived so long, that by the time it was approaching Ceres, he was excited to find out what the white spot was. We followed your blog as this world grew from a fuzzy blob into one of the best-mapped bodies in the solar system. (Question: which are better mapped, now? 67P/Churyumov–Gerasimenko and the moon are the obvious candidates, possibly Mars -- does anything else come close to Ceres and Vesta?) A "best close-up photo of Ceres" before and after Dawn would be a fun comparison. We have enjoyed the poorly-concealed enthusiasm of your blog. For my son, it's literally been a lifetime. Thanks for the ride. 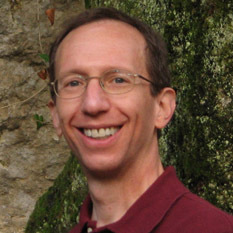 Hi Daniel, It’s really cool that your son and Dawn embarked on their life journeys around the same time and that he got engaged in Dawn’s adventure. And best wishes for your son's continuing adventures. I don't mean to be a spoilsport, but it’s difficult to compare maps on such different bodies. Is the criterion percentage of surface covered with panchromatic (black and white) images, percentage at some spatial resolution, number of pixels over the surface, or something else? (And, of course, mapping can extend to topography, gravity, selective wavelengths that reveal mineralogy and other physical properties, etc.) Ceres’ has more than 50,000 times the surface area of Churyumov-Gerasimenko, so a comparison is not at all straightforward. (By the way, Ceres' area is more than three times Vesta's area, the Moon’s area is 14 times Ceres’, Mercury’s area is twice the Moon's, and Mars’ is twice Mercury’s.) Of course, it's not a competition but rather a collective effort to learn as much as possible about the nature of the cosmos, and to me, we all win. I actually thought about including before and after pictures in one of my recent Dawn Journals, and I may do that if I write more about what we learned. It’s helpful to know I failed to hide my own enthusiasm. I’ll have to try harder. Thank you again. There are two upcoming missions, the Psyche and LUCY, that should hire you ASAP. Best of luck and thank you. Thank you, Messy. Psyche and Lucy both are exciting missions, and, like you, I look forward to their many wonderful discoveries! Thank you for the Final Transmission. The 3-D image you selected is a beautiful choice! : ) I shall miss this ongoing spacecraft mission. The mission of science study will continue as will the updating of text books. This mission has not yet ended.